It was been 2 years since the incident on the Chimera. My master and I have been training hard for the master, padawan training. We arrived on the dead planet of Ruusan. Our ship, Gold Runner, touched down on the dreaded planet. I grabbed my backpack from my bed when my master walked out of the freshers in a white snow gear. "What's with the snow gear?" I giggled. My master scowled hard at me, responding, "Take a look outside." I made my way to the window a saw that the terrein was filled with banks of snow. The wind was blowing the branches off the trees. I was currently dressed in a black body suit with some basic armor placed underneath. The clothes I was wearing had some basic protection against the wind, but against a blizzard, I would freeze to death. "Are you coming, Atina?" asked Master Ijaa, breaking into my thoughts. "Um, yea.. Give me a second." I responded. I searched my closet in search of my white snow jacket as well as pants. I changed into the jacket with ease and made my way outside. In the snow, my master was already waiting for me. I raced towards him, strugging against the wind and snow. I placed my goggles over my eyes, and the hood over my head. Through the beaded comlink in my ear, I could hear the ragged breathes of my master. Suddenly, the pilot got ahold of our frequency. "Please be warned that we a taking off in 10 seconds." I raced towards my master's position as the ship took off. I dived into the freezing snow covering my head with my arms. When the sound of the ship faded, I shooked the snow out of ny hair, wiping off the fine snow from my goggles. I walked over to mh master, covered in fine particals of snow. I sound of the crunching off boots made me turn around. I realized that the master, Syn Adel, was racing as far away from us as he could for our training, through the comlink, I asked my master, "Master, what is our mission?" my master responded seconds later. 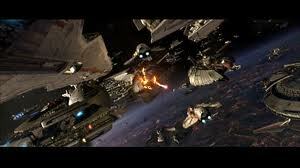 "Master Adel will hide on this force foresaken planet and we will have to work as a team to find him. He will give us 5 planet rotations before we will meet up at RV point. The first 4 hours for us will be to get familiar with the territory. We continued scouting the area. In the tradition Master/Padawan Missions, or MPM, the Master would usually place the tested Master and their Padawan's comlinks into a lockbox. But since the weather of Ruusan was imposible to hear each other, we were allowed to keep our comlinks. After 4 hours of walking, the chase had begun. At this point, the snow had stopped falling and the wind had subsided. The sun was peaking out from the clouds, shining a briliant yellow shade. When we made our way to the woods, there were fresh tracks, marked with a noticable marking of the Republic Insignia. I crouched down to inspect the tracks carefully. I removed my goggles, using the force to sense who made it and what was his or her intentions. As I carefully inspected the tracks, I felt a ripple through the force. I turned around and aimed my blaster towards my sense, when my master walked out of the clearing. I sighed and holstered my saber. I began to inspect the tracks again. I realized that the tracks were made by Master Adel. The tracks led to the north side of the planet. Realizing the wearabouts of Master Adel, I began jogging silently towards the position the force guided me. My master was following me calming. I decided to use the force to mask my position in the force so Master Adel couldn't sense me. When I arrived at the postition where I felt Master Adel, I found his body slumped on a tree. He was pale and his eyes were dialated. I realized that he was drugged. My master appeared behind me, placing his strong hand on my shoulder. I began to look through my backpack for my medical kit. I found a stim and injected it into the artery in his neck. His skin tone began to become a little redder, but his body tempurature was still down. I grabbed a thermal blanket from my backpack, placing it over him. Out of the blue, I sensed a person behind me. I turned around and found my master on the floor with two assaliants over him, and a blaster in my face. Chapter 3 is still in progress. Please wait for a few days/weeks. It will be ready soon.